In WizeHive, there are multiple different types of forms, which collect different information from different parties for different purposes. In general, information is collected either externally, from applicants or entrants, or internally, from administrators or reviewers. Internally collected information typically involves assessments, reviews, or notes based on the externally collected information. When you want to collect initial data through forms on the web from applicants or entrants, there are two types of forms you can use: a Webform and an Application Form. The key difference between the two is that an Application Form requires the user to establish a login ID and password before they can complete the form and a Webform does not. Since an Application Form is attached to a login, we provide both a “Save Draft” and “Submit” button on an Application Form. Conversely, there is only a “Submit” button on a Webform. So, an applicant can log into an Application Form, do some work, save a draft of their work, log out and come back later to complete and submit their form. Using a Webform, the form must be completed and saved all at once. Because there is a user login and password associated with an Application Form, the applicant can log back in at a later time to print their completed form(s), submit additional entries (if applicable), and submit Follow-Up Forms that capture additional data related to the applicant or entrant. When should I use an Application Form? The one potential limitation of an Application Form is that the user ID is usually set to the user’s email address. If a user wants to submit more than one entry with an Application Form, then multiple entries are associated with the same email address. If advanced settings for the Application Form are turned off (we call this Advanced Cart), the user will only have one application for a given Application Form. If the form used is an Advanced Cart entry form, they will be able to make multiple submissions. What will distinguish their entries will be a specific page ID. To make the applicant aware of these page IDs to access their entries, an email with a specific URL can be sent to them in order to access their entry. There would be a different URL for each entry. A Webform, on the other hand, is typically used in contests to collect contact data or for short intake forms. 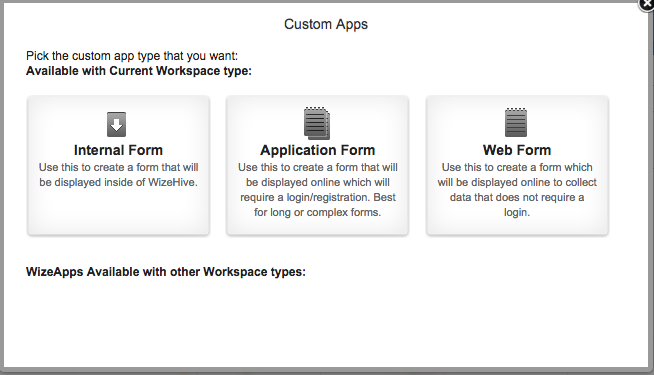 With a Webform, we remove the additional layer of complexity associated with a login and password. However, this also removes the ability for someone to save a draft and come back later to finish their entry. You can still collect email information from the applicant – but instead of being part of the login, you make their email address a required field on the form. This provides a bit more flexibility in that you can allow someone to enter a contest or application process as often as they want – or you can use the email field on the form to limit entries by making that field require a unique value (from everyone else). You can learn more about these three form types in the corresponding article for each.